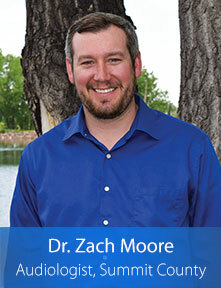 Dr. Zachary Moore is originally from Cincinnati, OH, and attended Ohio University, where he received his Bachelor’s Degree in Hearing, Speech, and Language Sciences. Dr. Moore then went on and earned his Doctorate in Audiology from the University of Lousiville. Dr. Moore completed his residency with Hearing Rehab Center and has gained valuable experience fitting and programming today’s latest hearing aid technology, Bluetooth® technology, and assistive listening devices. He also has extensive knowledge in the diagnosis and treatment of hearing disorders. Dr. Moore is passionate about helping people hear better and improving the quality of lives of his patients. In his free time, he enjoys exploring Summit County with his wife and his dog, camping, hiking, and exploring the mountains.